The Man Bird is a very lucky chap, and every so often I like to remind him of this fact. Our nest is very modern; we share house-work and bank accounts, so I take my turn to take us out to dinner. 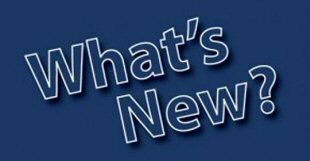 We decided to pay The Bulls Head at Repton a visit as we really enjoyed one of its’ sister establishments, The Joiners Arms at Quarndon. We managed to find a space in the car park, which I have to say isn’t the biggest for the size (and popularity) of the venue. The side entrance we used led us into a fairy light bedecked covered “court-yard” which was very atmospheric at dusk. A lovely young lady showed us upstairs to our table, which was directly under the willow sculpture of a Bulls Head; it looked amazing. The area we were dining in was very busy; there were a couple of large groups celebrating family birthdays as well as other groups of diners. 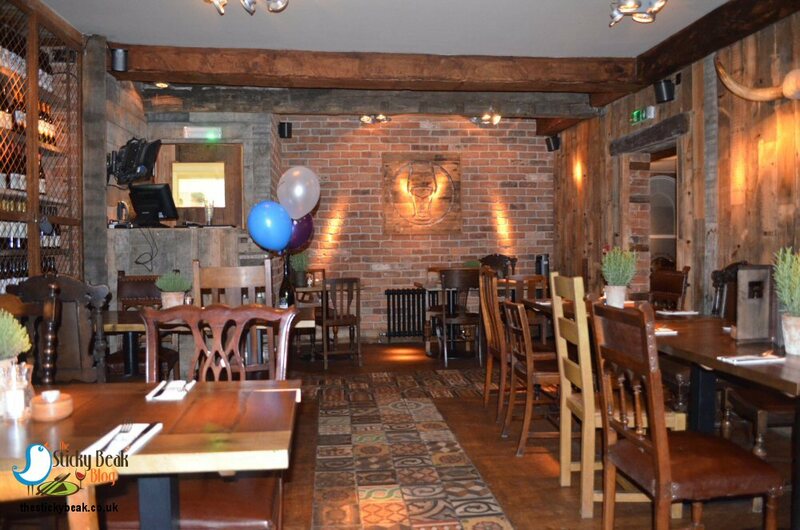 I loved the quirkiness of the pub and the exposed brickwork, wooden and tile floors, and the chunky wood tables were right up my street. Our server for the night was a lovely chap called Cainaan, and he got our drinks sorted in next to no time; my type of guy :) We kicked things off with the Bread Basket to share. The wooden platter came laden with Garlic Flat bread, Garlic and Rosemary Focaccia, Homemade multigrain- and white – breads, Olive oil and Balsamic, Hummus, Tzatziki, and marinated Green Olives and Tomatoes. 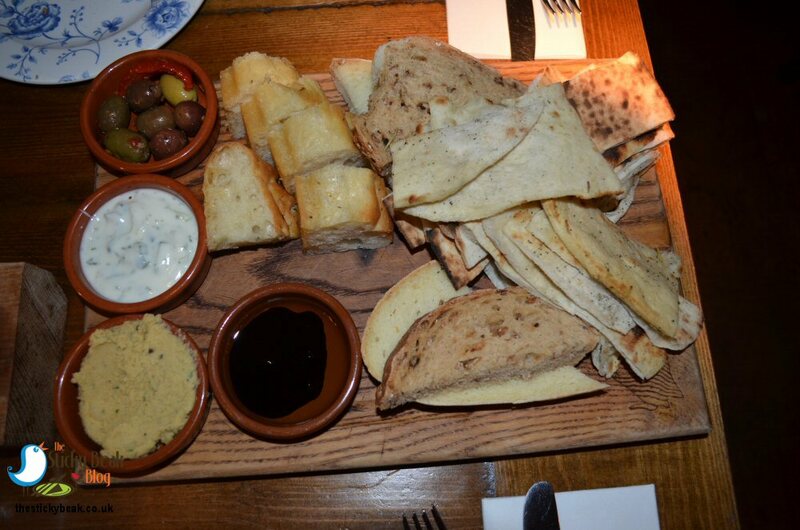 It was a lovely mix of bread types, textures and flavours all perfect for dipping into the accompaniments. Both of us loved the slightly chunky Hummus, and I was wolfing down the herby Tzatziki with its fine slivers of Cucumber as if it was going out of fashion! There was a nice amount of Olives to go at, and the Tomato was bursting with taste; it really bounced around on the palate. The Olive oil was superbly fruity, as you would expect from a good quality extra virgin variety, and it paired brilliantly with the sharp-but-sweet Balsamic. What we really liked about the Bread Basket was the fact that you could relax and just eat at a leisurely pace. His Nibs and I were chattering away as we dipped in and out of the platter; it was a wonderful start to what would pan out to be a superb, relaxed meal. Cainaan came and checked we were ok and even brought us some more bread and a little pot of Olive Oil, bless him. As we had done at The Joiners Arms, The Man Bird and I ordered from the same menu so that our dishes would arrive at the same time. 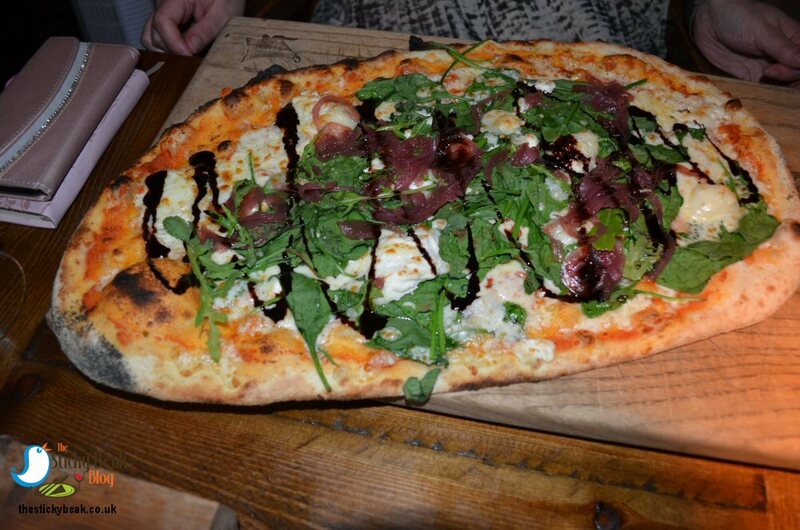 There are two kitchens at both pubs; the main kitchen one that does burgers, steaks and other meals, and the Pizza oven that just does the garlic breads and Pizzas. Each kitchen operates separately so if you order one meal from one menu and one from the other, they probably won’t arrive at the same time. I chose the Athens pizza: Goats Cheese, Bulls Head Tomato sauce, Mozzarella, caramelised Red Onion, Spinach, and Balsamic glaze; His Nibs fancied the Boston variety: pulled Pork, sliced Peppers, Bacon, Red Onion, sprinkle of Cajun, Parsley, sliced fresh Tomatoes, BBQ sauce, Bulls Head Tomato sauce, and Mozzarella. Both Pizzas were hot and fresh out of the wood fired Pizza oven, and they had amazingly crispy, thin bases. 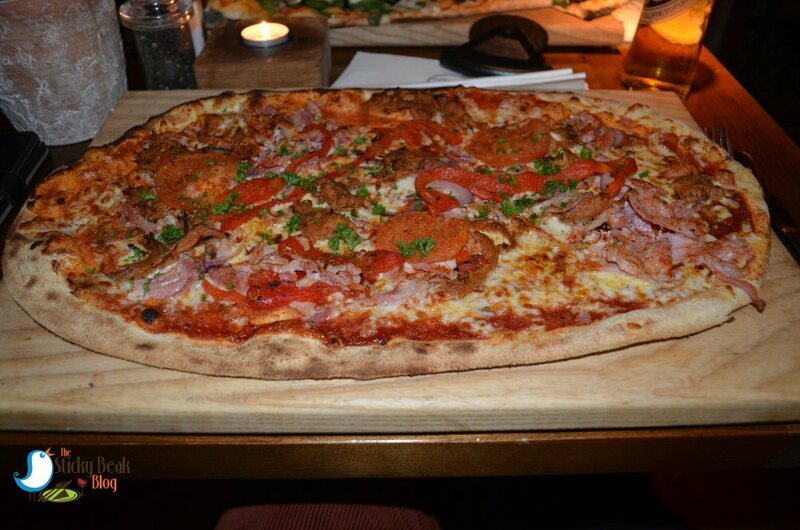 It’s safe to say that the team at The Bulls Head don’t skimp on toppings, both Pizzas were groaning under the weight of their load! My pizza was delicious and His Nibs had the same opinion about his. The Boston pizza had a nice heat to it thanks to the Cajun spices; not in a lip-tingling way, but you do need to like your spice! At this point in time I should confess as we were being very naughty parents, and breaking the cardinal rule of the dinner table; we asked for half of our Pizzas to be boxed up to take home, before ordering dessert. Yes, I know, you should eat all your dinner up before you’re allowed pudding; but rules, schmules and all that. There was absolutely no question of what we were having for dessert. When a venue makes its own authentic Italian Gelato fresh on the premises it would be a total travesty not to have it; after all, you can have other desserts at places that don’t make their own Gelato any day of the week. 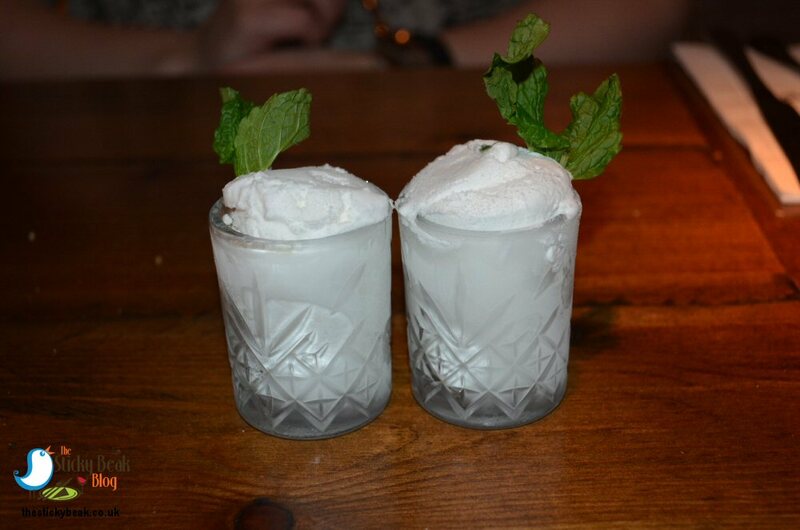 Jack Frost in all its minty glory was calling my name, and the Lemony Snickett was lassoing The Boy Wonder in expertly. 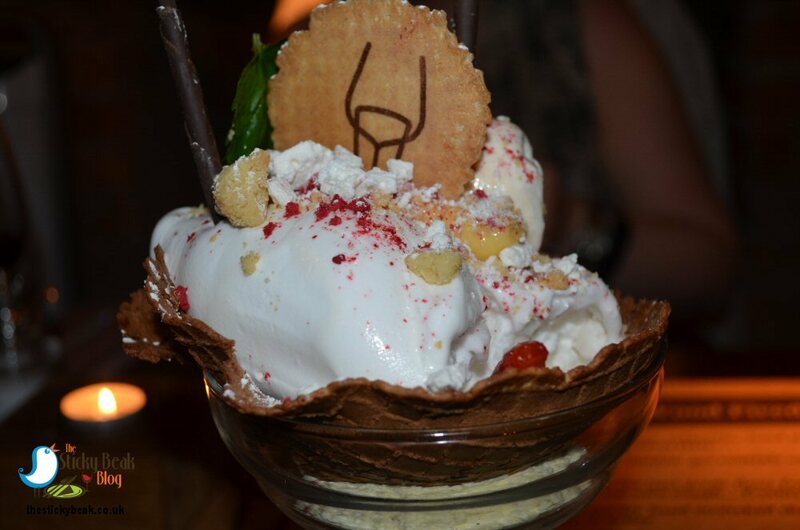 Both desserts are presented in very stylish sundae glasses and are lined with delicious fresh waffle cones. 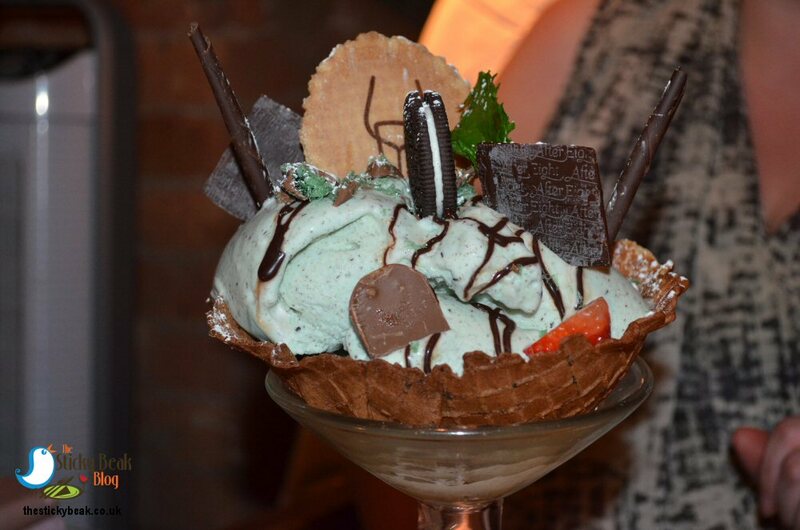 My Mint Choc chip gelato had hot Fudge sauce larruped all over it and was topped with a plethora of mint Aero Bubbles, Peppermint crisp, After Eight mints and a Mint Oreo cookie. There was a wafer disc, Chocolate sticks and whipped Cream crowning the whole lot and it looked rather scrummy to say the least. A lady at the next table couldn’t help but laugh at the delight on my face, and her companions said they were going to have one for their pud. Normally we would have a couple of coffees to end the meal with but we just hadn’t got room for anything else in our tummies, not even in liquid form! It was a superb meal though, in relaxed, friendly surroundings. Cainaan had been an absolute star with us from start to finish; nothing was too much trouble for him, and he definitely contributed to the positivity of our evening.